The aim of this work is to analyze the behaviour of the acoustic pressure field in fluid-filled waveguides having small irregularities on the walls. In a previous publication [J. Sound Vib. (2008), doi 10.1016/j.jsv.2007.12.001], an analytic solution was presented for a non dissipative fluid. This solution emphasizes the acoustic coupling of modes which are the solution of the Neumann boundary problem in the regularly shaped waveguide which encloses the real waveguide. The model makes use of the integral formulation with an appropriate Green function which illustrates two mechanisms of energy exchange between modes, namely bulk coupling and surface coupling, the first one depending on the depth of the roughness and the second one depending in addition on the local slope. 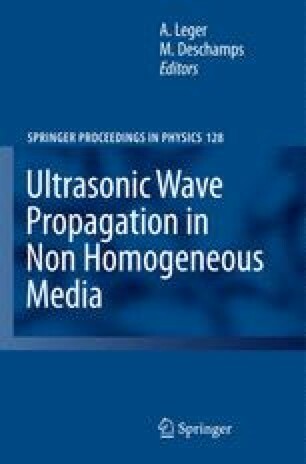 It provides interpretation of the attenuation phenomena of the propagating modes due to the irregularities. In the work presented here, a model in which viscosity and heat conduction of the fluid are considered allows us to take into account the dissipative phenomena (which take place in the boundary layers) in order to interpret better the attenuation phenomena.